Did you know sponges are great for DIY crafts? 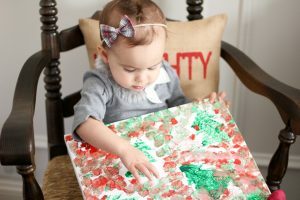 Izzy had a blast using sponges to great a holiday themed painting. 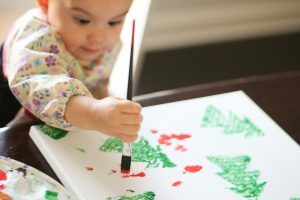 She went “dip, dip” into her paint and “dot, dot” onto the canvas around the trees we created together. Step 1. 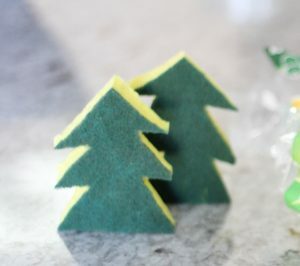 Use a permanent marker to draw a tree shape onto the sponge. Step 2. 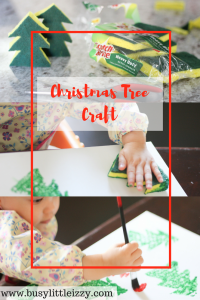 Cut the sponge following the tree lines you just drew. Step 3. Prep your crafting area with wipes, paper towels, pour the paint onto a paper plate or paint palate. Step 4. 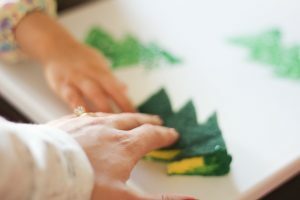 Help your child with dipping the tree sponge into the green paint. Step 5. 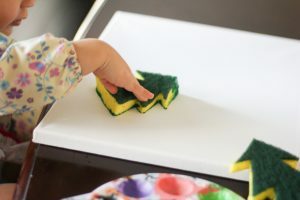 Help your child with pressing and lifting the sponge off of the canvas. Step 6. 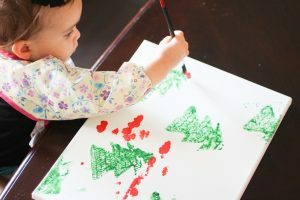 Once you have finished adding as many trees as you want, allow your child to “free paint” around the trees. Izzy admiring her final product! 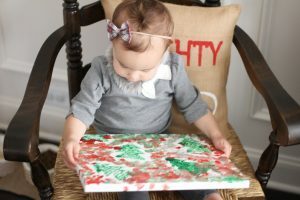 Love that craft – turned out adorable! What a cute craft!!!! I love these sponges! Never thought of using them for a a little craft project like that! This looks like so much fun, I’m going to try this with Isabella! I love this idea so much! Izzy is a little artist!!! This is such a cute idea!! I need to do this with my kids!